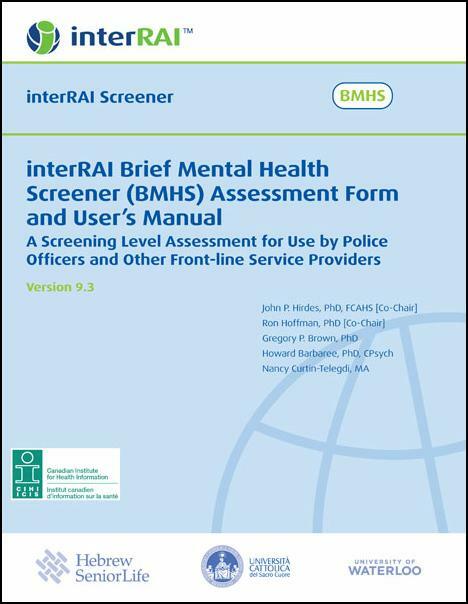 The interRAI Brief Mental Health Screener (BMHS) is based on and intended to complement the interRAI Mental Health (MH) Assessment System for In-Patient Psychiatry, the interRAI Community Mental Health (CMH) Assessment System, and the interRAI Emergency Screener for Psychiatry (ESP). The interRAI BMHS was developed to assist front-line police officers and community service providers to identify and respond to persons with mental health concerns. It is designed as a brief screener only, with two versions of the form. The interRAI BMHS-Police is intended for use by front-line police officers and the interRAI BMHS-General is designed for use by community organizations (for example, neighborhood outreach programs, emergency medical services).